Gold! There are rumors that long ago a treasure was hidden in a city now buried under the Nevada desert. Nancy and her friends plan to join a dig sponsored by two colleges to hunt for the gold. Before she starts, the young sleuth receives an ancient stone tablet with petroglyphs on it. With this amazing clue, however, come a threat and danger from a thief who also wants the treasure. 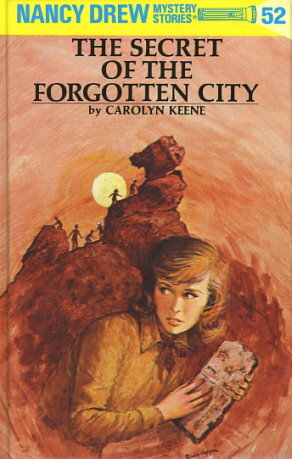 One harrowing adventure after another besets Nancy, Bess, George, Ned, Burt, and Dave in 102-degree temperatures as they pursue Nancy's hunches above and below ground. They are assisted by a fine Indian woman and a young geology student, but both are unwilling participants in a strange plot. In the end Nancy and Ned nearly lose their lives, just after she has discovered the priceless hidden treasure of gold.